The sense of smell is joyous as Diptyque limited edition Holiday 2017 candles are here. 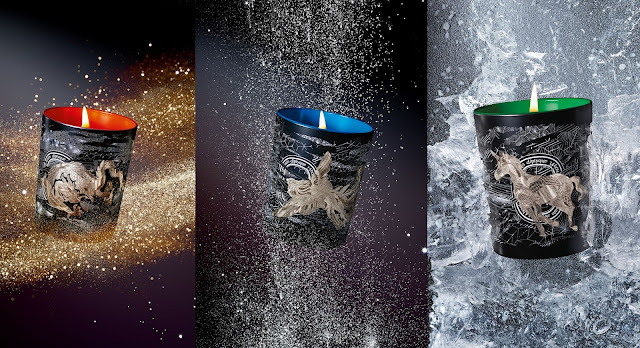 This year, Diptyque's wintry candles are inspired by the constellations and they have collaborated with Philippe Baudelocque to draw fabulous celestial animals design on the candles such as Frosted Forest that is represented by a Unicorn, Fiery Orange which is a Dragon and last but not least is the Incense Tears by the Phoenix. Fiery Orange - the cosmic Dragon gives off both light and warmth. Half bird, half snake, it inspired diptyque to create a woody fragrance that's sweetened with sizzling orange rind as if tossed into the flames. Incense Tears - the Phoenix builds a nest with Laurel leaves and Spicenard twigs, Cinnamon and Myrrh. Frosted Forest - the Unicorn brings to mind Medieval mythology's enchanted, evanescent forests and the exhilarating aroma of majestic pine tree-lined path. Of course other than the 3 exclusive Holiday candles, Diptyque has also included a few limited edition products into the Holiday line-up, such as their iconic Advent Calendar, 3 Candles Gift Set, Giant Berries Candle and one of our most excited additions is the, Constellations Carrousel ! The carrousel magiccally dances in circles thanks to the heat generated by the candle flames, revealing enigmatic shapes through a fascinating play of light. It's truly never too late to get in the Christmas spirit, so read ahead to scope out your new diptyque wintry scent. Diptyque holiday collection is available in November 2017, at diptyque store and kenspothecary nationwide.